I am so excited to be sharing this with you! Have you liked the stationery we've been posting in our Etsy shop? Here's a chance to purchase our papers good live at an incredible coffee shop across from the University of Texas! Just north of downtown Austin. Aside from seeing other really great vendors that will be selling vintage crafts and frills, I'd love for you to stop by, say "Hi! ", get Austin's best double shot of espresso & see your lovely face! Mark your calendars! 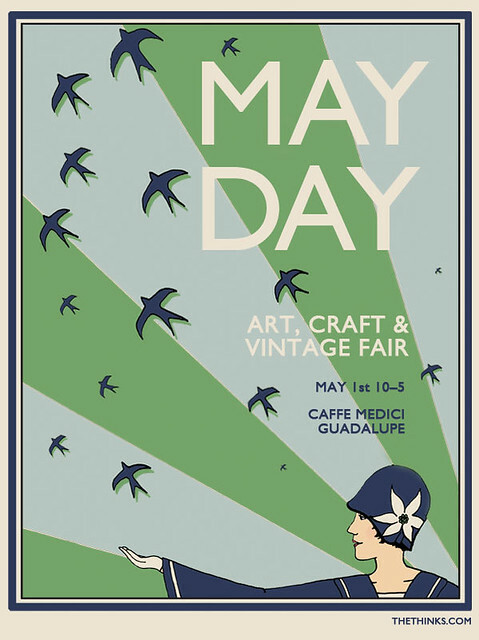 We'll also be featuring several items during May Day we don't yet have in the Etsy shop, so come on by! Here's a little live serendipity: Caffe Medici where the fair will be held, used to be called Metro. When I went to UT, Metro was *my hangout. I haven't been in so long, but I really love that coffee shop. It has so much character. I'm honored to be a vendor at Hannah's Fair! Thanks so much, Hannah! So now you should go check out her site, then stop by her Etsy and oohh and ahhhh over her talent! This is one reason why I should live closer.